The people who are closest to me in my inner circle know that giving is my love language. I love to give gifts. Thinking through things I can make or purchase for someone to make them smile and help them feel appreciated, finding or making whatever I decide on, then packaging the items up prettily, with intention and care, and sending them off to their new home makes me so incredibly happy. When my husband comes home with a surprise 'just because' gift for me, or an unexpected and thoughtful gift arrives from a friend in the mail, I practically melt. So you can probably guess that Christmastime is one of my absolute favorite times of the year. I like to give gifts all throughout the four seasons, but Christmas gives me a major excuse to love on people a little extra (and all at once!) so I tend to have a lot of fun with it. If you like giving gifts too (or if you're just trying to come up with some new ideas for your gift list/wish list this year), and are looking for some ready-to-gift items (my DIY list is coming later), I've put together a list of some lovely items from some of my favorite small businesses that would appeal to your plant-loving friends here for you today. A few of the features even include interviews with the business owners! Let's kick off the gift guide with a special announcement, shall we? We now have 6-month and 12-month gift subscriptions to AromaCulture Magazine available in our shop! Give the gift of AromaCulture Magazine to your plant-loving loved ones this year. for more information about gift subscriptions, click here. The first item I'd like to share with you today is a new travel diffuser that was recently made available by my favorite diffuser-making company, Organic Aromas. I love that most of their pieces are made by hand (you can watch videos of their diffuser making process on their Youtube channel) and are customizable, and that they are super committed to making sure that your essential oils never come into contact with plastic. This is something that's important to me, personally, so I really appreciate that this brand specifically creates diffusers that keep plastic parts away from my oils. 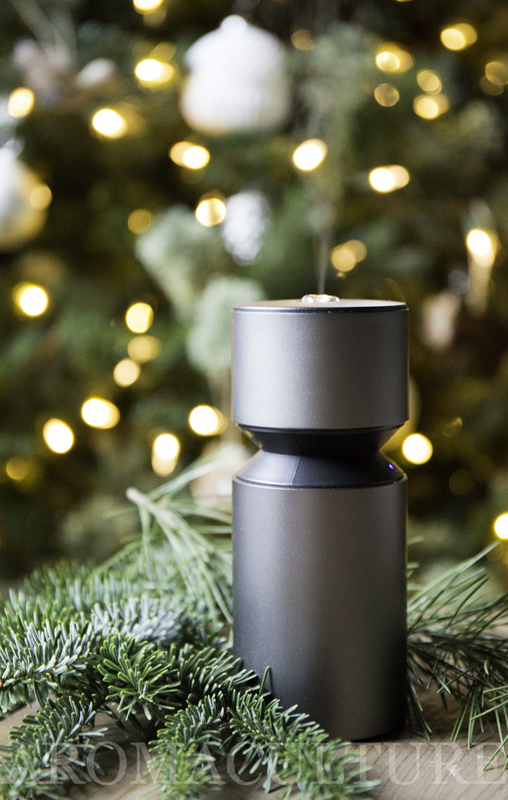 This family-owned small business' new travel diffuser is battery powered (rechargeable), can fit in the cup holder of your car, and is made with anodized aluminum and glass. It has a built-in timer and is super easy to pack in your suitcase, so it's perfect for travel as well. I've mentioned in the past that I've never found a car diffuser/travel diffuser that I like, so I tend not to share them. This new little guy, though, has changed that for me. It's officially my new favorite for diffusing on the road and in hotel rooms, though it definitely doesn't need to be reserved only for traveling. While everything from Lotus Wei is absolutely lovely, I'm especially loving their Aura Mists lately. Their signature flower essence formulas are combined with aromatic essential oils in these delicate, yet potent energetic mists, which are available individually or in a set of 6 that includes their famous Joy Juice, Inner Peace, Infinite Love, Quiet Mind, Inspired Action, and Radiant Energy blends. I've had them on my desk for a little while now and I love spritzing them throughout the day. They have such intricately beautiful aromas. Joy Juice, Infinite love, and Inspired Action are my current favorites. Set of 6 - 10ml mists, $50. My favorite organic, medicinal herb seeds come from Richo Cech and his family over at Strictly Medicinal Seeds (formerly Horizon Herbs). Richo is an herbalist, herb farmer, and master storyteller. His books are treasured volumes in my herbal library. My latest acquisition from his shop? A stash of Sweet Violet seeds ready for planting. (I can't help but sow a few packets of them every year! You can never have too many Violets.) I talk more about my experience with this brand in this blog post. Organic Sweet Violet Seeds, $3.95. Prices vary based on the piece. Shown: Aquamarine spheres. Prices vary. Some of you already know that I like to collect handmade pottery - especially functional pieces like mugs and small bowls and dishes that I can use and feature in the magazine with all sorts of pretty herbal preparations. (Jon and I are actually learning how to make our own pottery pieces right now, too!) This sweet mug was made by Summer of Kilned with Kindness, who is currently my favorite potter. Her pieces always make me smile - perfect additions to any collection and a lovely gift for the tea or coffee drinking friend in your life! We've shared their products with you before and we'll probably share them again because we just love them so much. Moon Valley Organics offers high quality body and personal care items made with organic herbs grown right on their farm. This Oatmeal Sage bar is our long-time favorite soap from their selection. If you've never heard of Juniper Ridge, beware. You'll probably swoon once you take a few moments to look through their product offerings and watch the videos about their process. They make the finest trail-formulated botanical fragrances (distilling on location!) that we've ever found. We're long-time fans of their products. Check out this collection of sample colognes, which makes it easy choose a favorite so you can order a full size bottle. Another jewelry artist that I've purchased from throughout the years is Mallory Wingo of Wingostarr Jewelry. She handmakes the most beautiful wire-wrapped and beaded gemstone jewelry and all of her pieces are unique (many are one of a kind) and vibrant. This citrine slice necklace is one of my longtime favorites from her shop. She now offers a chakra-aligning version of it that features several different gemstones! I first found Katelyn's jewelry shop on Instagram a few years ago (we were living in CA at the time) and purchased this ammolite necklace, one of my favorite pieces. Katelyn specializes in electroformed jewelry made with copper and/or sterling silver. Her birthstone + quartz crystal necklaces are beautiful. will only be available in a limited amount and for a limited time, but you can order one here if you love them as much as I do! Grab one while they're available - they'll go fast. Now, for some small business fun! The bath teas formulated by Denise for Wholly Rooted, her small-batch farm apothecary are exquisite. The aromas are intoxicating and they are absolutely lovely with their vibrant, hand-harvested herbal blends of unsurpassed quality. Pick up a few for your loved ones' stockings this season. They'll be delighted! I like to add a little bit of violet-infused oil to mine to make them feel even more luxurious and then massage the tea bag into my skin in the bath. Note: Denise's full interview is featured in our December issue of AromaCulture Magazine. Hi Denise! Thanks for taking time to share with us today. Could you tell us a bit about your story? How/when did you start working with plant-based ingredients? What was it about them that drew you in? I have always been a very eco-conscious person from food to body and home products. I also have been an avid gardener for many years - and all of that seems to coalesce into working with my hands, growing my own food and medicinal herbs, making a lot of my own bath, body and home products - not only to be more green and environmentally sound, but also to avoid allergens, to use what is local, to use what I connect with. What we put into our bodies is as important as what we put on our bodies and in our homes. All of this has driven me to pursue more advanced level courses in herbalism, holistic nutrition and aromatherapy. Health and wellness encompasses our whole life, not just our food or exercise. As a gardener, you get to work with a plant from seed to mouth, which is truly a profound experience. Plants, their actions, chemistry, and tenaciousness are fascinating and I love learning about my local plants, the changes in habitat and migration of plant species due to our changing climate, and the impact of soil on nutrition and gut microbiota. Plants enrich my life, and are a part of everything we do! I am currently working on completing my clinical hours to get the official AHG RH (Registered Herbalist) designation. I feel like I’m never done learning, and plants, herbalism, aromatherapy and holistic health have so much to teach us, and I love working with and helping people. Plants have also helped my own healing, and learning about plants is a lifelong evolution based on where I am at each moment, and what my body needs. What does your creative process tend to look like? When you sit down to create a new product, do you go through a list of steps or do you tend to lean more toward creative expression and go with your gut? I love to make items based on a need at home or for a friend. I love blending herbs, essential oils, and carrier ingredients to find a balance and synergy that not only fits the physical need, but also has other purposes such as uplifting the mood, helping with focus, or calming the mind. I tend to use products on my family and myself for awhile before creating bigger batches. I love working in my herbal studio with the twinkly lights on, music playing, and a vast quantity of fresh ingredients to create with. Both. I love knowing the properties of plants and essential oils and working to create a harmony that works on both physical and emotional levels. So many people are stressed, busy, anxious, nervous, frazzled and tired. Aromatherapy can really uplift and support emotional wellness, while the herbs and oils can support the skin and body. I make all products in small batches, by hand, in my herbal studio. I like working in smaller batches as I think products should change seasonally and I like to be inspired by new ideas and ingredients based on what I grow, harvest, forage or preserve. Tell us a little about the kinds of ingredients you like to use in your products. Many of the products with oils are infused with plants I have grown myself in one of my gardens - my hilltop prairie home garden or in the calm and peaceful rural garden where I grow many medicinals surrounded by chickens, goats and bees. My herbs are also in the salves, bath teas, body oils and serums. I grow many of the herbs from seed to bottle, grown organically (though not certified). I harvest by hand all summer, and carefully dry all herbs in dehydrators, and store them in my herbal apothecary. My dried herbs tend to have so much more color and aroma than commercially dried herbs, because of how I harvest and dry in smaller batches. I also distill some of my own hydrosols in my copper still, and all other hydrosols I purchase are organic. I source other ingredients based on quality, a transparent supply chain, and organic as much as possible. I don’t mark up my products as much as most people do, which is a fault I suppose, but I want those good quality ingredients as well as pricing that is accessible. I hand make everything myself and make items in small batches, so it is a labor of love in many ways. Which of your products do you use most often? We use the chest rub every single night with my son who gets sniffly when in his bed. I feel like we use the salves by the gallon - my kids call it salve-ation, so I now call one of them by that name. Any little bump or scrape or blister - all get the salve-ation. Body butters are used just out of the shower. We diffuse and use sprays at bedtime. I have used the facial serum and glow facial toner for months on myself now. We carry aromasticks with us everywhere we go (great for kids who need help transitioning) and we use inhalers and steams when we have a cold. We have rollerballs in our home first aid kit and in the purse - for various things. I make custom products for people as well, and some of my favorites that we also use at home include shower gel, hand sanitizer, lotion blends, and massage oils. At home, we also make all of our own tinctures, glycerites, extracts, teas and more. We keep looking for a farm with a commercial kitchen to expand our offerings (and life) in the future! WhollyRooted.com - That is where the online shop is along with my blog with recipes and gardening tips, information on consultations, custom products and more! I also love to write and have articles in AromaCulture coming up! Wholly Rooted is on Facebook: facebook.com/whollyrooted, at Instagram at instagram.com/whollyrooted and Pinterest at pinterest.com/wholly_rooted. The Tulsi Rejuvenating Oil from Apoterra Skincare is lightweight and rejuvenating, just as it promises. It smells divine and slightly masculine and the aroma lingers throughout the day. If you love the smell of Tulsi as much as we do, we think you'll adore this body oil. Apply it just after showering to soak up all of its oily goodness. It pairs perfectly with Apoterra's Tulsi Luminous Scrub, which shares its delightful aroma and leaves our skin feeling perfectly polished and soft. One of our favorite giftable sets this holiday season! Note: Dominique's full interview is featured in our December issue of AromaCulture Magazine. Hi Dominique ! Thanks for taking time to share with us today. Could you tell us a bit about your story? How/when did you start working with plant-based ingredients? What was it about them that drew you in? I have sort of always been fascinated by plants and the power they hold. I remember as a kid going into my mom's garden to collect flowers, herbs and earth and mixing all of it with liquid hand soap to make a "better" hand soap. It was a total mess, but the curiosity and desire to work with plants was there. I actually went to school in a totally different direction - I wanted to work in the arts because I thought I could be more creative in that world. So I went to film school and became a lighting technician for major motion pictures and television. It loved working on big movies, but it wasn't as fulfilling and creative work as I had hoped. At the same time that I realized I didn't want to continue with my film career, I had this calling to learn more about plants so I decided to start studying foraging and herbal medicine on my own time. Then one day a friend gave me a soap making kit and I fell in love. I went on to study botany at NYBG, took an intensive herbalism program through the Herbal Bear School of Botanical Medicine, and became a certified aromatherapist the the Aromahead Institute (a NAHA and AIA approved program). I start with an inspiration jump off point - whether it be a specific need (like clearing acne), a kind of product (like a facial oil), an ingredient I am really interested in working with or a scent concept. From there I brainstorm formulations and write down my ideas. I do a lot of research and often times my concept for the formulation will change a lot until I find something that I am very excited about. When working with essential oils, I love using the Aromahead Component Database as a resource to help me determine which oils are the best choice. Then I will source the ingredients I need (if I don't have them on hand) and will start working in the lab. Sometimes the formulation only needs minor tweaks, but other times I go through many versions over many months to improve scent, color, texture and effect. When it comes to creating scents, writing them down and thinking them through is not always where I start. I usually prefer to start with a concept ("bright citrus with sweet floral notes" or "calming and empowering") and then I will take out my essential oils. I will smell my way to choosing the ones I want to work with, and start blending that way. Once I have a blend I like, if I want the blend to have a specific purpose I will look up the oils I chose to see if they align with what I want them to do. (B) A little bit of both! It depends on what I am focusing on. If I am focusing on the results, I like to first go with instinct in the ingredients I choose to put in the formulation, but then I will do research and adjust the formulation based on my findings. If I am focusing on something that is for enjoyment, such as an aroma, texture or color, then I learn more by being hands on and creative, and will make decisions more based on my gut instinct. I only source sustainable and clean plant + mineral based ingredients. I am a huge fan of working with raw plants and clays, but I also see value in plant derived actives that are usually produced in a lab. I don't see the world as black and white, but more as many shades of grey. So we use raw plants, pure clays and salts, hydrosols, essential oils, oil infusions, herbal extracts (water or glycerin substrate), but also proven safe and effective vegan and plant derived actives like hyaluronic acid, coQ10, and vitamin C. When I source my essential oils, I always make sure they come with a GC/MS report so that I can be sure of they quality and effect. I also am pretty stringent about having traceability as far as the country of origin, year of production and certifications regarding my ingredients because this tells me a lot about the quality and sustainability of our ingredients. When it comes to the lab produced ingredients, I will only source ingredients from manufacturers that are transparent about the raw materials they use in their process. I share a lot of this information on our website through our batch # system which you can look up to find out, for instance, what country the chamomile essential oil in your facial oil came from and what year it was distilled. My toners! I use them as my morning cleanser, mist them on before applying my facial oil or balm, and mix them with my Activated Puirfying Mask. In the summer I use the Neroli Clarifying Toner because I tend to be more break out prone then. In the winter I use our Rose Hydrating Toner. I also love misting them on throughout the day for a refresher and for aromatherapy (I make them with organic hydrosol blends). Bella Vista Naturals is a small family-owned farm in Georgia. They offer handcrafted apothecary products (salves, lip balms, lotions and scrubs, soaps, etc.) made and formulated by herbalist Anne-Marie Bilella, who has been published in prior issues of AromaCulture Magazine. One of our favorite products this season is her Spa in a Jar Kit, which includes 5 different products all specially developed to help you feel relaxed and pampered through the season. The herbal bath tea in this kit smells absolutely incredible! Hi Anne-Marie! Thanks for taking time to share with us today. Could you tell us a bit about your story? How/when did you start working with plant-based ingredients? What was it about them that drew you in? In 1990, my husband and I moved from New York to Georgia to our place, Bella Vista Farm. I worked for different companies for a few years and after our son was born, I knew I wanted to find a way to work for myself. My child ate fast food and drank diet soda at the babysitters, all before the age of 2 and at that time I realized we need to get a hold on eating better and using chemical free products. My dear friend, Cyndi Ball of the Lazy B Farm and President of the National Ladies Homestead Gathering, helped me to get on the right path of good health. She taught me about farm fresh eggs, local meat, how to make cheese and most importantly to try herbal remedies. During the first year of the Ladies Homestead Gathering, I learned about wild weeds - Chickweed was my first obsession! I couldn't believe that weeds in our yard could nourish and heal our bodies. I created my first product, a salve with Chickweed and Plantain. Yep, that was 2011 and I am still obsessed with wild weeds! When you sit down to create a new product, do you go through a list of steps or do you tend to lean more toward creative expression and go with your gut? My brain has all kinds of ideas constantly running around in it. I see a need or an ailment and start brainstorming about what herbs and what type of carrier I use for this new product. Sometimes folks will tell me about a product they would like or one they saw a recipe for and then ask if I can create it. Most of my products are tested on my Herbal CSA members. They usually get first dibs on any new product or limited quantity products. All the herbs and mushrooms are organic, homegrown without chemicals or wild harvested. We use organic vinegars, organic coffee, organic milk powders, high quality oils, butters, waxes. Not every oil/butter is organic but they are non-gmo. Our beeswax is locally sourced. I use everything I make but most often, The Pit Stick(deodorant), Peppermint Lip Balm, Lavender Body Butter, Super 10 Stock Powder (mushroom/herb blend) and Holy Basil Tea. You can't go wrong with herbal tea blends, especially when they're formulated by small local businesses using hand-harvested local ingredients. One of our favorite brands at the moment is St. Fiacre's Farm. Their Coastal Cranberry Spice tea is outstanding! It features organic Hibiscus flowers, locally sourced cranberries and spicy, warming herbs, hand-formulated in small batches on their farm. CeAnne has offered you 10% off purchases in her shop if you use the coupon code AROMA17. Hi CeAnne ! Thanks for taking time to share with us today. Could you tell us a bit about your story? How/when did you start working with plant-based ingredients? What was it about them that drew you in? My husband and I hand blend artisan loose leaf tea on our micro farm of around 2 acres. We both live, work and homeschool our four adopted children here on our small farm. We have been married almost 16 years and have adopted from around the world including Russia, Bulgaria and right here in Oregon. 3 of our 4 children have special needs and so it is important to us that we have not only a school environment but work environment that allows them to grow with as much help as we are able to give them. The farm life has been a blessing in regards to helping their delays from orphanage life. I've been into herbs since high school almost 17 years ago starting with aromatherapy before it was popular. I really started diving deep in 2013, taking online herbal classes and reading book after book on herbs and their medicinal qualities. Growing up a city girl compared to my husband, who grew up the son of a ranch hand in Montana, I wasn't much into gardening. The more I learned about herbs, the more I realized how easily accessible they are and easy to plant or forage. I found my love of gardening during that time and we started St. Fiacre's Farm and our line of herbal teas, lip balms and salves. The things that drew me into herbs most was their ability to assist in healing naturally without the side affects of chemical drugs (which I'm highly allergic to), how easy they are to access and how available they are to almost anyone. From foraging in the yard (think dandelions and blackberry leaf) to just grabbing herbs out of the produce section (basil & thyme), baking aisle (cinnamon, cardamom) or our own spice cupboards! Our products are created in a few different ways. We start with the reason we are creating it: Is it a request from one of our customers? Is there a local ingredient we have access to that we want to feature? Or is there a flavor we are going for? When I went to create our Coastal Cranberry Spice blend I had a mulled wine flavor in mind. It's such a lovely holiday flavor, warm and fruity with lots of spice. I'm allergic to alcohol and this tea blend gives those who can't or don't want to consume alcohol an option during the holidays. It tastes similar, looks similar, but the health benefits are much more. We were able to access cranberries from the Bandon, Oregon area which makes it that much more tasty! Our Farmer's Wife Raspberry blend on the other hand was made with women's health in mind and so the basis of that tea is herbs that are especially beneficial for women. Then there are customer favorites such as our Cascade Earl Grey, a lavender earl grey, which is a standard amongst black tea drinkers. And our Cherry City Chai which was created because I love Chai! But we wanted to feature a local farm in the area too and Cherry Country out of Rickreal is just wonderful. We toured their cherry factory and their chocolate room and are so excited to offer an heirloom cherry from Salem, the Royal Ann, in this blend. A little creative expression does show up because not only do these teas have to taste wonderful, but the artist in me insists that they look beautiful and we get many compliments on that at the farmer's market. With our monthly tea club, I get to be more creative and create blends monthly for our members. These blends get to feature even more local ingredients because they are a smaller batch blend and can be highly seasonal without the demand from our wholesale accounts to have them year around. Our October blend was an Apple Pie Chai with Queener farm apples and our November tea club members received a Pumpkin HazelNOT Coffee that included pumpkin, marigold and calendula grown right here on our farm. It was so fun to blend because we know the story of those ingredients. Not only did we watch them grow here on the farm ourselves from seed to harvest, but our viewers on our Youtube channel got to watch the whole process too! They got to see where their tea came from and that is what gets us excited! We love to source local first. That could mean that we grow it here on our micro farm or it could mean that we source it from other local farms. Our ideal is that the bulk of our ingredients are sourced this way. We have plans to increase local ingredient usage even more in the next year. For the time being we have a few ingredents that come off of our own farm and most of our berries and fruits are local from Oregon. As mentioned earlier our cherries come from Cherry Country, apples from Queener Farms in Stayton, lavender from Eagle Creek Lavender Farm, cornflowers from Floating Petal Confetti in Shaw, aronia berries from Mt. Hope Farms in Molalla, haskap berries from an OSU test farm in Corvallis, and hazelnuts from King Fresh Hazelnuts in Silverton. We are always looking for new local farms to utilize when sourcing our ingredients. In the coming year we hope to increase our own plantings here on the farm. We ran some test plots this year as we completed the building of our tea studio (our work space for creating and manufacturing our teas on the farm). When we can't source the ingredients locally, we make use of organic bulk herb suppliers such as Mountain Rose Herbs and Starwest-Botanicals. Local first and then quality Organic, both at once is ideal but not always possible. The products that we use most often around are farm are our medicinal salves from arnica, calendula and plantain salve to our lip balms. When we are sipping tea we rotate based on our mood or need. Our Ma's Tummy Tea when we need some digestive assistance, Farmer's Wife Raspberry daily in the mornings, Cherry City Chai when we need a pick-me-up, Mountain HazelNOT Coffee when we need a dark, deep, rich drink without the caffeine, and Willamette Berry Pie for dessert! Our farm store is online at www.StFiacresFarm.com and we are also all over social media. Facebook and Instagram are our most popular locations. We also have a Youtube channel where we V-log weekly about our farm and include DIY farm life tutorials which include anything from how we built our 42 foot long green house to how to use herbs like borage and lemon balm. We share a little glimpse of our life here at the farm with our family. We also have a website dedicated to teaching others about growing herbs, using them and of course how to create their own tea blends at www.GrowCreateSip.com That membership is opening shortly. Happy gift-giving! Share some of your favorite small businesses in the comments section below to spread some small business love this season. Disclaimer: The new travel diffuser by Organic Aromas was sent to us by the company to share with you. Our review reflects our true opinion about this company and its products. They are truly our favorite diffusers and we can recommend them to you without reservation. The products that are accompanied by interviews with their makers were also sent to us by the business owners, who were awarded an opportunity to be featured in our holiday gift guide. All opinions shared are our own. The Lotus Wei aura mists were sent to us as a gift recently and we loved them enough to feature them here. All other products featured in this gift guide were purchased by us over the years and we are happy to recommend them to you.